For those of you who don’t deal with PBS (Public Broadcasting System), they actually are part of a network of regional or in some cases statewide systems. In the area around Mansfield they are served by Ozark Public Television (OPT). While all the PBS stations show some of the same shows, and others are offered as an option nationally and others are only locally produced. One that is locally produced by OPT is a video magazine called Ozark Watch. This 29 minute show originally aired October 16, 2011 and is called “Laura Ingalls Wilder Profile.” I found them checking for another feature that I didn’t find yet, but hope to be sharing soon, so check back. Note this is different from the documentary co-produced by Ozark Public Television and the Laura Ingalls Wilder Home and Museum that is available through the Mansfield giftshop. This starts with an interview in a backyard that clearly a set. 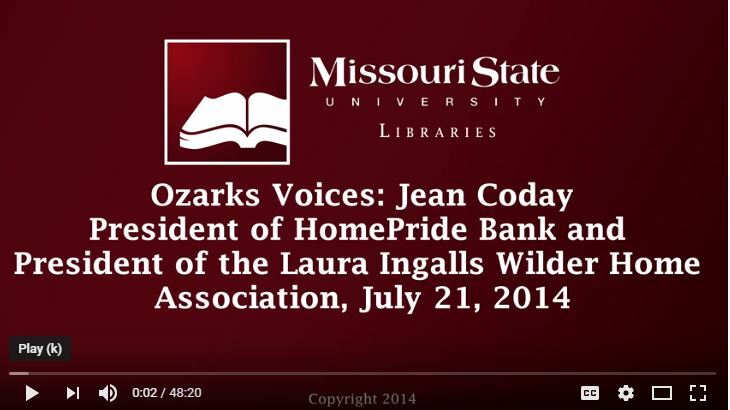 They start with Jean Coday, the director of the Laura Ingalls Wilder Home and Museum. She says she’s been on the board since 1960, I had no idea she’d been involved so long. The first few minutes are a tag that is repeated later. It really starts about 1:50 into the video. Her interview is interspersed with some of the wonderful images that form part of Mansfield’s collection that they have exclusive use rights to, given the Ken Burns moving photo treatment. 15:00 Video of Mansfield Museum interior, very excited to see this, normally you can’t film inside. Talk then turns to the future plans, they plan on adding a hen house with chickens, they have added a garden, and they hope to have a replica of the first cabin that was there when the Wilders arrived soon. 18:00 Long Range Plans for the site. Then they bring in Daniel Hancock of Butler, Rosenbury & Partners to explain their master plan for the site. 20:00 Architectural drawing of the site drawing. From what I could see and what they discussed 1. Almanzo’s workshop is still there ♥ (from the tear down stuff they were talking about, I was afraid it was on the hit list. It really has the most interesting story of any outbuilding on the farm.) 2. The money for the library/archive building that they are working on as we speak comes from a USDA grant from what they said. The USDA (United States Department of Agriculture) would seem odd, but it’s the rural tourism angle, and grants are grants. 3. They have 5 of Laura’s complete manuscripts. 4. (And this would make more sense for USDA to be funding) they want to include hands on activities to learn about farming in the 1920s. In all this gives a lot more information about their long range plan. This video has been out since 2011 presumably I don’t know why they haven’t pushed it more. UPDATE 2014: It has just been over a year since I originally posted this and things haven’t changed much. Since I posted this they have changed their website and now have it embedded on their homepage, but personally I think they are missing something not having my notes there. 🙂 So far they haven’t had luck gaining the funds that they’d hope they’d have. I’m not sure how long they have to USDA money and they haven’t yet broken ground on the site. They have been actively campaigning for their capital fund. If you want to contribute, check out their donation page.